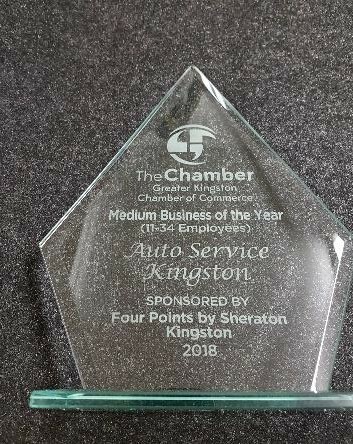 We are very proud to announce that one of our clients, Auto Service Kingston, has been awarded “Business of the Year” by the local Chamber of Commerce. This award is given to businesses who excel in customer and employee relations, business growth, standards and ethics, as well as community involvement. Congratulations to Steve Bernard and his Team, who were the highest ranked in all the assessed categories. Steve has led his team to incredible success and has been able to expand his business and capacity, while dramatically improving the bottom line, quality and service to his clients. Steve, and the entire Auto Service crew, are passionate about providing “value” to their customers. To that end, a year or two ago, Steve committed to a complete business transformation using Lean. 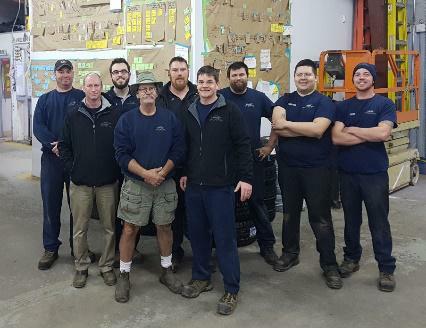 In that time and with financial support from St. Lawrence College, Lean Advisors provided in-house training of Lean concepts and methodologies, adapting and applying them directly to their processes in the shop and office settings. The results were immediate. Outcomes far exceeded expectations and the business has grown in leaps and bounds, thanks in no small part to endorsements from existing customers, who have witnessed the transformation. Every business owner deserves this type of success. And they can have it! Many leaders have the passion and are only missing the knowledge of how to structurally make change, both operationally and culturally. Small business is key to our economy’s growth and for every business that maximizes profits and grows, our community and our country are better served and strengthened.